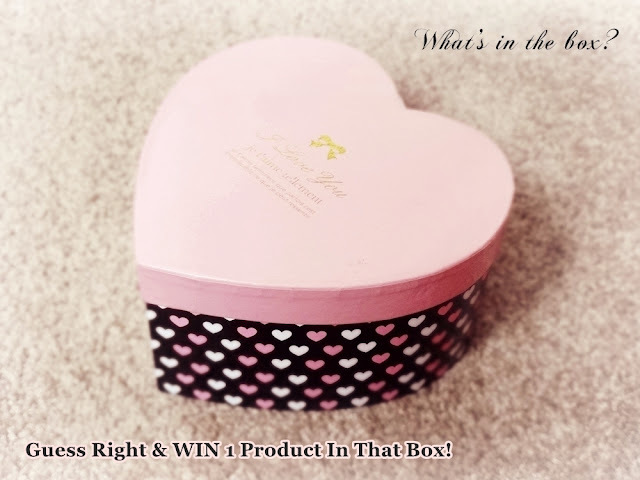 There are some things in this cute heart-shaped box. One person out of all those who guessed correctly will WIN 1 product in that box. I will reveal it in a blog post on Monday. You have to be a Subscriber or follower of this blog on Bloglovin' or Facebook. Closing Date: Monday, 20th May, 2013 at 7:00 PM IST. omg !! is it tht heart shaped lipstick / blush inside ?? A LipBalm inside the box is for sure ! Lipbalm ! Bow Shaped Earrings or Necklace =) I think. I think its the pretty blush with heart shape /lipstick with heart shape. I think its a watch . you write product - this is mean that its not jewelery? I think it's lipstick here! mirror.....small mirror.i hope iam right! a cute pendant with a chain? According to me : Perfume! Marks & Spencer Valentine's Day Limited Collection. I guess its the Revlon Balm Stains as they are the most popular lipsticks in your blog this month. a box that says... I loved you so much that sometimes this is inexplicable that I can feel?? Well, the first thing that comes into my mind is... nothing. But nothing cannot be the answer, can it? So my answer will be "perfume". Do you have a proper set of stuff in there - perfume, body wash, moisturizer, or something like that? Just asking. CZ i feel its gonnna be Archie Products lipstick /blush or a nail paint . Fingers crossed I hope i win this time :) yay .